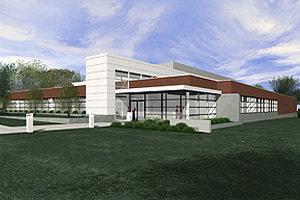 An artist’s rendering of the Howard T. Ricketts Regional Biocontainment Laboratory. Watch a video overview and tour of Ricketts Laboratory. On Sunday, April 6, representatives from the University Medical Center, Argonne National Laboratories, the U.S. Department of Energy, the National Institutes of Health and the State of Illinois will cut a ribbon to celebrate the upcoming completion of the Howard T. Ricketts Regional Biocontainment Laboratory, located at Argonne. On Wednesday, April 16, Argonne staff, investigators from the University, and representatives of the community surrounding Argonne will have a chance to see the new facility at an open house from 11 a.m. to 2 p.m. Both events are by invitation only. In 2003, the National Institute of Allergy and Infectious Diseases named the University the lead institution for the Great Lakes Regional Center of Excellence for Biodefense and Emerging Infectious Diseases Research and awarded the center more than $35 million in research funding. The NIAID also awarded funds to the University to build a Regional Biocontainment Laboratory at Argonne National Laboratory to support research conducted by the GLRCE. Small laboratories already existed at the University and Argonne for safely studying infectious microbes, but at 54,100 gross square feet, the new laboratory will enable researchers to study four or more different pathogens at the same time. A primary focus in building the laboratory was safety. A design firm with extensive biosafety experience—Flad & Associates, Inc. of Madison, Wis.—created the original plans, in collaboration with the scientific team and in consultation with the National Institutes of Health, the Centers for Disease Control and Prevention, and others, including local public safety sources. All aspects of the design and construction had to meet stringent guidelines that protect those who work in the laboratory as well as those who work or live nearby. Safety features include redundant mechanical systems (ventilation, electrical and other utilities), controlled airflow, HEPA-filtered exhaust, tightly controlled access to the building and multiple ways to isolate and disinfect specific areas. Whenever possible, researchers will use experimental models of the microbes they study that have been genetically modified to reduce the likelihood for human transmission. All laboratory personnel will undergo specific and intensive training and will be closely supervised by scientists who have experience working with these agents. Federal, state and local agencies will routinely inspect the operation. GLRCE pulls together research teams from 27 institutions in the six states in federally designated Region V. The research teams will involve more than 300 scientists, said Schneewind, including a core of more than 60 key researchers who specialize in microbiology, infectious diseases, public health, medicine, vaccine research and pharmacology, as well as related disciplines such as biochemistry, computer science, engineering, mathematics and nanotechnology. Besides performing research, scientists in the GLRCE and the Ricketts Laboratory will act as a regional resource for public health officials, providing expertise, rapid diagnosis, support and advice about containment and treatment in the event of a bioterror event or the emergence of new disease-causing agents. They also will teach young scientists and technicians how to do productive and safe research on infectious diseases. Participating institutions are Chicago, Northwestern University, Argonne National Laboratory, Battelle Memorial Institute, Illinois Institute of Technology, Illinois Institute of Technology Research Institute, Illinois State University, Loyola University of Chicago, Mayo Clinic, Medical College of Wisconsin, Michigan State University, National Wildlife Health Center, U.S. Department of the Interior, Ohio State University, Purdue University, the University of Cincinnati, the University of Illinois at Chicago, the University of Illinois at Urbana-Champaign, the University of Michigan, the University of Minnesota Twin Cities, the University of Minnesota at Duluth, the University of Notre Dame, the University of Toledo, the University of Wisconsin at Madison, the University of Wisconsin-Milwaukee, Wayne State University and Wright State University. The Ricketts Laboratory is named for the University’s Howard Ricketts (1871-1910), who discovered the organisms that cause Rocky Mountain spotted fever and typhus. Although the ribbon-cutting event and open house occur in April, finishing touches, extensive testing and multiple certifications of the Ricketts Laboratory will not be complete until mid-summer. Research involving “select agents” could begin as soon as August.